What are the benefits of Agmatine? Agmatine appears to be a very versatile supplement, we decided to carry it due to the overwhelming number of requests and the amount of information we found from postings all over the Internet. Peole using this supplement are reporting improved endurance, improved recovery, enhanced performance, dramatic and long lasting pumps, and improved overall body composition including increased lean muscle and decreased body-fat. Some people are reporting pumps that last all day with supplementation of 1-2 grams per day. Improved Insulin Response – Agmatine may help improve insulin response through enhanced insulin production, which can lead to positive benefits for those looking to improve body composition. Improved insulin response is thought of in bodybuilding circles as a key to a leaner, harder, more muscular body. Nootropic Effect – Agmatine may help those looking to achieve a mental edge, whether it is in the gym or in day to day life. It can also help support a healthy mood and has anti-anxiety and antidepressant properties. Stimulation of LH & GH Levels – In addition to the obvious appealing effect on overall body composition, the stimulation of GH and LH levels can also be beneficial for helping maintain a healthy lifestyle as we age. This stimulation of pituitary hormones may also lead to stimulation of other hormones such as IGF-1. Neuroprotective Role – Agmatine plays a neuroprotective role due to its role as an antioxidant and its prevention of over excitation by glutamate. Cardiovascular Benefits – Agmatine has a potential hypotensive benefit that may help aid in cardiovascular health. This hypotensive role is important in a healthy lifestyle for obvious reasons, but may also be found to be beneficial for bodybuilders or athletes. Agmatine is derived from arginine, a primary amino acid. 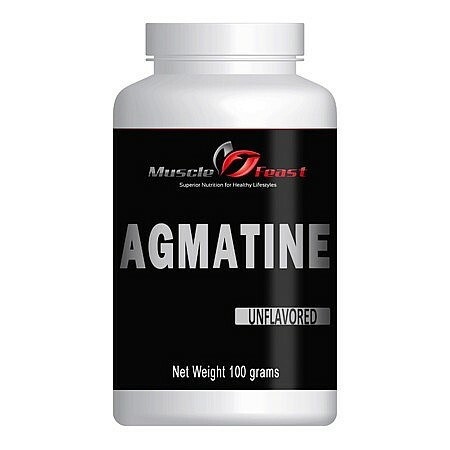 Agmatine acts as a neurotransmitter to induce production of growth hormone, nitric oxide, creatine and protein decrease blood glucose levels; and aid in the removal of nitrogen waste products from the body. A report in the Proceedings of the National Academy of Sciences indicates that agmatine is capable of preventing and treating spinal cord injuries, inflammation and neuropathy; however, every exogenous supplement has some side effects associated with use or overuse. The patent for agmatine-containing products indicates that only three of the trial participants reported gastrointestinal disruptions at low doses. Those disruptions included diarrhea, nausea and vomiting that began after two days of taking agmatine and continued until treatment ceased. Only one of the people experiencing these problems dropped out of the clinical trial because of the discomfort caused by agmatine. A study published in the “European Journal of Pharmacology” indicated that large doses of agmatine actually lowered the overall pain threshold even though low doses improved overall response to chronic pain. Rats were utilized to determine if agmatine was capable of improving the response to acute pain from a new injury at low doses. Unfortunately, agmatine appears to have little ability to limit acute pain, even though the same dose appeared to stop pain perception from old injuries. For most people, the usual agmatine dosage consists of 500mg twice daily. Some prefer to take 500mg pre workout, and then another 500mg dose after they finish their routine. Others take the entire dose at one time. Agmatine is readily available in a powder form, and the price varies according to manufacturer. However, it is very important to note that there has not been very much literature published on Agmatine sulfate and recommended dosages have not been established. Be sure to follow relevant directions on product labels and consult your pharmacist or physician or other healthcare professional before using. Pregnant women should not take this supplement. Always consult your doctor first.